Movements in a circle, or through a circular course, or through a course that leads back to the same point; usually referring to blood circulation, but can apply to other commodities such as bile salts. /cir·cu·la·tion/ (ser″ku-la´shun) movement in a regular course, as the movement of blood through the heart and blood vessels. collateral circulation that carried on through secondary channels after obstruction of the principal channel supplying the part. enterohepatic circulation the cycle in which bile salts and other substances excreted by the liver are absorbed by the intestinal mucosa and returned to the liver via the portal circulation. extracorporeal circulation circulation of blood outside the body, as through an artificial kidney or a heart-lung apparatus. fetal circulation that propelled by the fetal heart through the fetus, umbilical cord, and placental villi. Schematic diagram of fetal circulation, with red indicating the highest level of oxygen saturation, blue the lowest, and purple an intermediate level. hypophysioportal circulation that passing from the capillaries of the median eminence of the hypothalamus into the portal vessels to the sinusoids of the adenohypophysis. intervillous circulation the flow of maternal blood through the intervillous space of the placenta. persistent fetal circulation pulmonary hypertension in the postnatal period secondary to right-to-left shunting of the blood through the foramen ovale and ductus arteriosus. 1. the circulation of blood through the placenta during prenatal life. portal circulation a general term denoting the circulation of blood through larger vessels from the capillaries of one organ to those of another; applied to the passage of blood from the gastrointestinal tract and spleen through the portal vein to the liver. primordial circulation the earliest circulation by which nutrient material and oxygen are conveyed to the embryo. pulmonary circulation the flow of blood from the right ventricle through the pulmonary artery to the lungs, where carbon dioxide is exchanged for oxygen, and back through the pulmonary vein to the left atrium. systemic circulation the general circulation, carrying oxygenated blood from the left ventricle to the body tissues, and returning venous blood to the right atrium. umbilical circulation fetal circulation through the umbilical vessels. vitelline circulation the circulation through the blood vessels of the yolk sac. movement of an object or substance through a circular course so that it returns to its starting point, such as the circulation of blood through the circuitous network of arteries and veins. Medtalk Blood stream. See Enterohepatic recirculation, Fetal circulation, Pulmonary circulation, Systemic circulation. Movements in a circle, or through a circular course, or through a course that leads back to the same point; usually referring to blood circulation through the network of arteries and veins unless otherwise specified. Movement in a regular or circular course. Movement of blood through the arteries. It is maintained by the pumping of the heart and influenced by the elasticity and extensibility of arterial walls, peripheral resistance in the areas of small arteries, and the quantity of blood in the body. Use of a mechanical device to augment or replace the action of the heart in pumping blood. Secretion and reuptake of the sodium glycocholate and taurocholate found in hepatic bile. Bile salts enter the duodenum and emulsify fats in the small intestine. They are resorbed in the terminal ileum and returned to the liver in portal blood. The movement of blood through the left atrium and ventricle of the heart, aorta, arteries, arterioles, capillaries, venules, veins, vena cava, and back to the right side of the heart, into the pulmonary artery, lungs, and left side of the heart again. Circulation established through an anastomosis between two vessels supplying or draining two adjacent vascular areas. This enables blood to bypass an obstruction in the larger vessel that supplies or drains both areas or enables blood to flow to or from a tissue when the principal vessel involved is obstructed. Movement of blood through the vessels of the heart, specifically from the ascending aorta to the epicardial coronary arteries to the penetrating arteries of the myocardium, the coronary arterioles, capillaries, veins, coronary sinus, and into the right atrium. A few of the small veins open directly into the atria and ventricles. Circulation in which substances secreted by the liver pass into the intestines where some are absorbed into the bloodstream and returned to the liver and re-secreted. Bile and bile salts follow this pathway. Circulation of blood outside the body. This may be through an artificial kidney or a heart-lung device. The course of the flow of blood in a fetus. 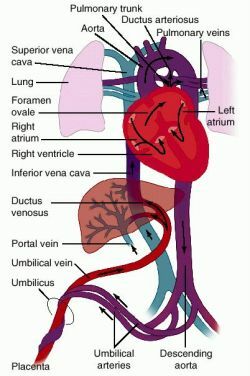 Oxygenated in the placenta, blood passes through the umbilical vein and ductus venosus to the inferior vena cava and thence to the right atrium. It then follows one of two courses: through the foramen ovale to the left atrium and thence through the aorta to the tissues, or through the right ventricle, pulmonary artery, and ductus arteriosus to the aorta and thence to the tissues. In either case the blood bypasses the lungs, which do not function before birth. 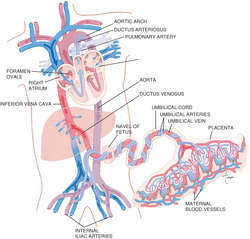 Blood returns to the placenta through the umbilical arteries, which are continuations of the hypogastric arteries. 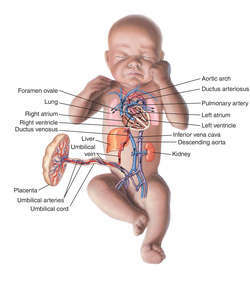 At birth or shortly after, the ductus arteriosus and the foramen ovale close, establishing the postpartum circulation. If either fails to close, the baby may be hypoxemic. Superior and inferior hypophyseal arteries (slender branches from arteries of the circle of Willis) that provide blood to the pituitary gland and adjacent regions of the hypothalamus. Venous blood from the pituitary gland drains into the cavernous sinuses and, from there, into the internal jugular veins. Some of the superior hypophyseal arteries form primary capillary beds in the hypothalamus and the veins draining those beds ramify again to form secondary capillary beds in the adenohypophysis (anterior lobe of the pituitary), thus forming a portal circulation (the hypothalamic-pituitary portal circulation). Releasing factors secreted from the hypothalamus into the primary capillary beds reach the adenohypophysis via the secondary capillary beds. The flow of lymph from the tissues into the lymphatic collecting system. Lymph is formed from the tissue fluid that fills the interstitial spaces of the body. It is collected into lymph capillaries, which carry the lymph to the larger lymph vessels. These converge to form one of two main trunks, the right lymphatic duct and the thoracic duct. The right lymphatic duct drains the right side of the head, neck, and trunk and the right upper extremity; the thoracic duct drains the rest of the body. The thoracic duct originates at the cisterna chyli, which receives the lymphatics from the abdominal organs and legs. It courses upward through the diaphragm and thorax and empties into the left subclavian vein near its junction with the left interior jugular vein. The right lymphatic duct empties into the right subclavian vein. Along the course of lymph vessels are lymph nodes, which remove bacteria and other foreign materials, thus preventing their entrance into the bloodstream. Lymph flow is maintained by a difference in pressure at the two ends of the system. Important accessory factors aiding lymph flow are breathing movements and muscular activity. A condition of newborns in which unoxygenated blood is shunted from the right to the left side of the heart through the ductus arteriosus and the foramen ovale, resulting in hypoxemia. It is caused by pulmonary hypertension and occurs most frequently in small-for-gestational-age infants and infants of diabetic mothers. 1. 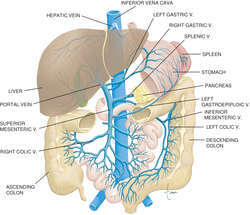 Blood flow from the abdominal organs that passes through the portal vein, the sinusoids of the liver, and into the hepatic vein before returning to the heart from the inferior vena cava. This pathway permits the liver to process and to detoxify substances entering the body from the gastrointestinal tract. 2. A portal system between the hypothalamus and the anterior pituitary gland. The hypothalamus secretes releasing or inhibiting hormones into the blood; they are carried directly to the anterior pituitary and stimulate or inhibit secretion of specific hormones. An obsolete term for the pulmonary circulation. The embryonic circulation of blood to the yolk sac via the vitelline arteries and its return to general circulation through the vitelline veins. Movement in a circle or around a circuit, especially the movement of the blood through the arteries, capillaries and veins, as a result of the pumping action of the heart. Movements in a circle, or through a circular course, or through a course that leads back to the same point. n the movement of blood through blood vessels. n the passage of fluids, electrolytes, and metabolites through the walls of terminal vessels of the vascular tree into and out of the tissue spaces. n the circulation of venous blood from the right ventricle of the heart to the lungs and back to the left atrium of the heart. n the circulation of oxygenated blood from the left ventricle of the heart to the various tissues and of venous blood back to the right atrium of the heart. Various tests have been described in the literature to detect fetal blood cells in maternal circulation. Using 500-nm PS beads, nearly all particles were retained in the maternal circulation or placental tissue, and the concentration of beads detected in the fetal circulation was 0. Frequency with which foetal red cells could be identified in the maternal circulation varied widely in various studies, i. The discovery of fetal cfDNA in maternal circulation during pregnancy raised the possibility of new methods for non-invasive detection of fetal chromosomal abnormalities. The damaged placenta releases excessive pro inflammatory and angiogenic factors into maternal circulation. In the past when hypertonic saline was used to induce abortion volume overload due to its escape into maternal circulation was another iatrogenic cause of pulmonary oedema. The reversal of the methylation profile in the postdelivery maternal plasma sample to become more similar to that of the maternal blood cells suggests that the fetal DNA molecules were removed from the maternal circulation (34). Fetal cell-free DIMA may be detected in maternal circulation. Because the amounts in the maternal circulation are usually very low, any exposure of a nursing infant probably is clinically insignificant. 7) Metformin also crosses the placenta and is concentrated in the fetal compartment, with the fetal level approximately double that of the maternal circulation. Maternal circulation in the first-trimester human placenta--myth or reality? Following delivery, this fluid is suddenly shifted to maternal circulation, increasing preload significantly and further increasing pulmonary hypertension.